… $470! That’s more than the auction coordinator thought I’d get! She was actually quite shocked. That said, I don’t know if I’ll do another auction quilt next year. I’m glad it went for so much, but I got caught up in the auction fervor and part of me was hoping for more. I’ll think about it. Thanks to all of you who left such encouraging comments! It means a lot to hear such nice things about my designs. After that weekend of auction dinner dances and running carnival games at the church fall festival, I took the day off to relax and catch up on other projects. Then at 4:30 a.m. on Monday morning, Penny made a new best friend. It’s amazing how your dog getting skunked changes your schedule! I think I’ve tried every home skunk remedy on the Internet, and she STILL STINKS. *Sigh. * I haven’t had much time for anything because she’s had almost a dozen baths in 6 days. 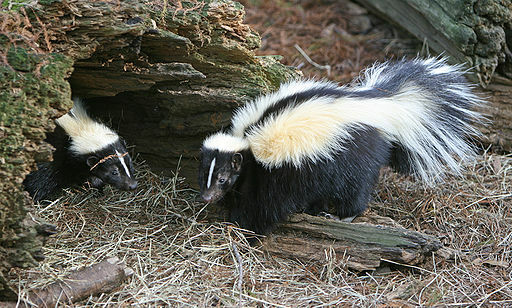 The following skunk remedies do not work: tomato juice, vinegar, and de-skunking enzymatic shampoos. The following skunk remedies sort of work: feminine hygiene products and this brand of dog ear cleaner solution. The following works, but you can’t get it near their eyes, making it a little useless in my case: the hydrogen peroxide/baking soda/dish soap solution found all over Google. Of course, one website said the best deskunking method is to not let your dog near skunks. … Wow. I never would have thought to keep Penny away from the skunks. The following things were favorite things that had to be thrown out because they were too skunked to save: purple ballet flats, Disneyland 50th anniversary t-shirt, and Penny’s polka dot collar. RIP, favorite stuff. I’m starting to think Penny was sprayed by some sort of mutant Super Skunk. I have been watching too many superhero TV shows. The last time I had a day off, Penny got Cherry Eye and had to be rushed to the vet. I’m starting to think I shouldn’t take days off from work. Carnivals are fun and all … if you’re not in charge. Then they’re exhausting. Also, kids don’t want to play water balloon toss. They want to have water balloon fights. I should have seen this coming. I can’t decide if I want to enter the Halloween costume contest at work. If I do, I’ll probably go as Mary Poppins because it’s the only idea I’ve got that’s doable. My first craft show of the season is in 13 days. When did THAT happen? I scheduled a freelance editing project for the week before said craft fair. When did THAT happen? My Square credit card reader came in the mail Friday. I can now take credit card payments at craft fairs. Pure. Awesome. Cost Plus World Market has their Christmas bakeware shop up and running, and I want Halloween to just go away so I can go all Martha Stewart and start decorating Christmas cookies RIGHT NOW. Hopefully regular crafty blogs will resume later this week. Unless Penny makes any more friends. Finish It Up Friday: Auction Quilt (& Silent Auction) !! !